Disney, maker of the new Star Wars film, has already taken advantage of yesterday's change to upload a landscape-orientated teaser video. 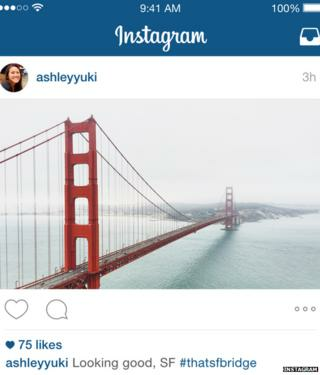 "It turns out that nearly one in five photos or videos people post aren't in the square format, and we know that it hasn't been easy to share this type of content on Instagram," the firm said in a blog post..
"Friends get cut out of group shots, the subject of your video feels cramped and you can't capture the Golden Gate Bridge from end to end." The move will also appeal to advertisers, said analyst Debra Aho Williamson. "It boils down to giving advertisers and users more options," she told Reuters. "You want people to be able to see more of your ad. It's something advertisers are definitely going to be interested in." Instagram announced in June that it would be opening up its platform to all potential advertisers in the coming months, via its parent company Facebook. "There are more than two million advertisers who actively use Facebook to market their business and we want to leverage the best of Facebook's infrastructure for buying, managing and measuring the success of ads on Instagram," the firm wrote on its business blog.